Microstructures of a–d) NaCl, e,h) Li2MoO4, f,i) Na2Mo2O7, and g,j) K2Mo2O7. NaCl sintered at a) room temperature and 75 % relative humidity (RH) for 24 h, b) room temperature and 85 % relative humidity for 10 h, c) 600 °C for 50 min, and d) 700 °C for 10 min. 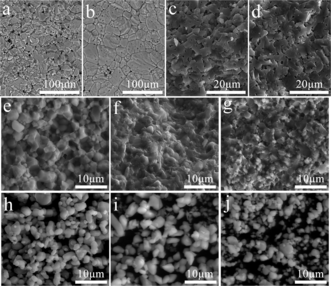 Cross-section of e) Li2MoO4, f) Na2Mo2O7, and g) K2Mo2O7 ceramics cold-sintered at 120 °C and 350 MPa for 15 min. Prepared h) Li2MoO4, i) Na2Mo2O7, and j) K2Mo2O7 powders.